Dan’s life is a mess. His dad just declared bankruptcy and that he’s gay all in one fell swoop. Now, it’s just him and his mom living in an old house they inherited from his recently dead great aunt. 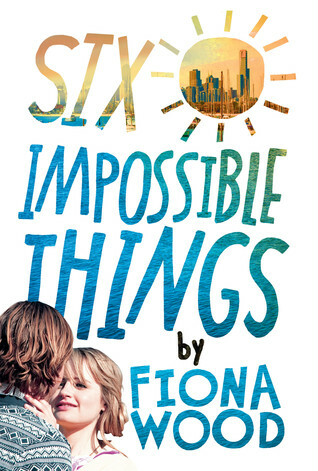 They have no money, Dan has to start at a new school in the middle of the year, and he’s made a list of the six impossible things in his life. The only bright side is Estelle, his new neighbor. Fiona Wood did a great job writing Dan’s story. The words flowed smoothly, and I felt Dan’s voice come through. Dan’s a cute, dorky boy. He’s been dealt a hard hand, but instead of dwelling on it (which he does do for a little bit), he decides to make the best of it. He gets a job, makes friends, and tries his best to help his mom out. None of this is easy for him and he has many difficulties, but he still tries and puts himself out there, which is the key. We could all learn a little bit from Dan. This is a loose retelling of the Cinderella story. It has the good and the bad, and it’s very relatable. The story is so much more, though. It’s about family and getting your life together. It was hard not to like Dan, even though he did some questionable things. He’s funny and dorky and just a plain ole cutie. I was pulling for him and Estelle to get together the whole time. Overall, I liked the book. It was funny and easy to read. This is definitely a younger YA book so it won’t be for everyone, but it’s a fun read. Plus, it takes place in Australia. How cool is that?